We wanted to share with you the lists of contests for 2019 J Day so that you can be best prepared to enter the various categories. There were a few changes made from the feedback we received from you and our judges. Yearbook categories were expanded and all overall contests will be judged within their membership size category. We continue to update and fine-tune the judges’ rubrics to give you the most complete and useful feedback possible. Please contact the MIPA office at [email protected] or 573-882-6031 if you have any questions. A complete document with instructions, rubrics and how to enter will be distributed. 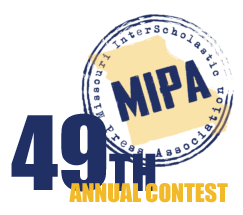 MIPA Board members are made up of volunteers who are teachers just like you. Please contact us with any concerns or suggestions on how we can improve the contest process. 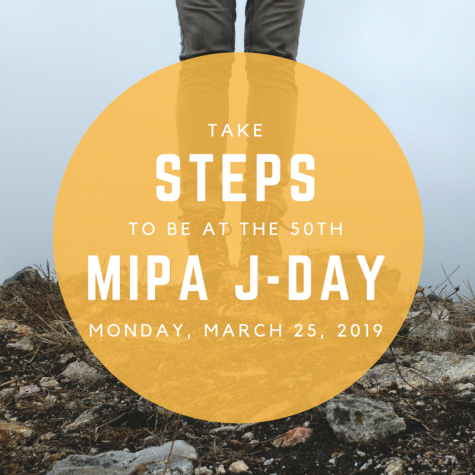 HOW TO ENTER: Use these 2019 Instructions to MIPA Schools/Teachers/Students document to enter the 2019 contest! All overall contest categories are divided by four school enrollment sizes, so all publications compete with schools of similar size. Enrollment size classifications are included on instructions for the contest. Announcements Only – student anchors read announcements. Announcements/Video – student anchors read announcements mixed with video coverage. Newsmagazine – student anchors introduce video coverage; no announcements are read. Each paid membership publication may enter one overall news website for critique. A talk show program (radio/podcast) that is no more than 10 minutes in length. You will submit one set of three different issues of your newspaper/newsmagazine for evaluation. One issue must be an early issue (September or October), and the other two issues may be any you wish. Newspapers will be judged independently of newsmagazines. All submitted pieces must have been aired via web, in-school system, etc., between August 2018 and the contest deadline. Broadcast categories will be divided by school size like print categories. Sports News Story – current sports news or game package, not a highlight reel, maximum length of 2 minutes. Sports Feature Story – feature package covering an athlete or sports program or sports-related topic, maximum length of 3 minutes. Commercial/PSA – commercial for an actual sponsor or a public service announcement on any topic, maximum length of 30 seconds of original material. Live Sports Broadcast – continuous coverage of a live broadcast or livestreamed sporting event, maximum length of 5 minutes. All submitted pieces must have been published to the entire school via web between August 2018 and the contest deadline. Online submissions must be part of a regularly occurring online publication, and not just loaded to a random site, for the purpose of entering state contest. Social Media Reporting – Enter by submitting a social media outlet, such as Twitter, Facebook, Instagram, Snapchat, etc. Judge will choose a time block of up to a week in the judging period, Feb. 16 to March 10, to look at the media feed for content. Blogging – Enter a link to a blog related to and under the umbrella of a student publication or production and not a personal blog. All submitted pieces must have been aired between August 2018 and the contest deadline. Each paid membership publication may enter up to eight total radio broadcasts or podcasts in any combination of the categories:. Newscast/News Feature– A newscast or news feature that is no more than 10 minutes in length. Radio News Package– Current events program that is no more than 10 minutes in length. Content should include current events, political events, sporting events and/or highlighting a local event affecting the community. Sportscast/Sports Feature– A sportscast or feature that is no more than 10 minutes in length. Public Service Announcement – An announcement of general public interest not more than 60 seconds in length. Must be written, produced and aired on your station. Promotional Announcement– A single spot promoting school, station, programs or community events that is no more than three minutes in length. Sports Play-by-Play– Play-by-play of a sports event that is no more than 10 minutes in length. All submitted pieces must have been published between August 2018 and the contest deadline. News Writing: Coverage of an event or topic that is newsworthy at time of publication. News Feature: Coverage of an event or topic that is not timely but represents newsworthiness. Editorial/Op-ed: Opinion piece that represents the publication’s stand on a topic or one writer’s opinion about an event, topic or issue; reviews. Sports Reporting: Includes events, season wrap-ups and sports feature stories. Editorial Cartoon – Student-produced illustration containing a political or social message that usually relates to current events or personalities. Infographic – a visual image such as a chart or diagram used to represent information or data, may include a photo illustration that relays information. All submitted pieces must have been published or plan to be published in the current 2018 yearbook and they must have been produced between August 2018 and the contest deadline. Overall theme/concept: Please choose four of the following to submit in a single PDF: cover, endsheet(s), title page, opening and/or closing spread, divider spread or graphic treatment(s) that help to explain theme or concept of the yearbook. Theme copy is expected to be on these pages. Themed Package is defined as design, writing, mods, photography, illustrations in one completed spread on more than one topic as in chronological or umbrella coverage. Yearbook Design is defined as the arrangement of photos, illustrations, type and text in a way that compels the reader to read. Yearbook Writing is defined as writing that exemplifies excellence but cannot be entered in the package category because it is not yet on a spread or the spread is incomplete. Yearbook Mods – is defined as a smaller amount of text with accompanying photos or illustrations that support a page’s main story. It is often considered the yearbook equivalent of a sidebar. All submitted pieces must have been published or plan to be published in a publication, such as newspaper/newsmagazine, yearbook or online, between August 2018 and the contest deadline. News Photo – Photograph of a school, community or national news event. Academic Photo – Taken in class or covering activity of the curriculum. Student Life/Organization Photo (not sports) – Taken of the activity of a club or other organized group. Photo that covers activities that do not occur during the traditional academic day (i.e., club activities, school play, dances, homecoming, outside of school, off campus, trends, etc.). Sports – Active photo of an athletic competition that captures motion, emotion and the competitive spirit of the athlete. Sports Feature/Reaction Photo – Photograph of emotional response to athletic competition by fans, athletes, coaches or other people involved. Portrait – Photograph, either posed or candid, showcasing the personality or newsworthy aspect of a person or group of people. Photo Illustration – Digital or darkroom manipulation of an image or a group of images to illustrate a concept. Please contact the MIPA office at [email protected] or 573-882-6031 with any questions.